WASHINGTON — Rumors of the death of NASA’s planetary science program are greatly exaggerated, according to the head of the agency division responsible for that activity. Speaking at an Oct. 27 meeting of the NASA Advisory Council’s Planetary Science subcommittee, Jim Green, director of NASA’s Planetary Science division, took issue with an opinion piece claiming the agency was gutting its robotic exploration program following a pair of upcoming missions. “It is not true the planetary program is being killed,” Green told subcommittee members participating via telephone and Internet. He was referring to an assertion by Robert Zubrin, an outspoken advocate of Mars exploration, in an opinion piece published Oct. 26 by the Washington Times. 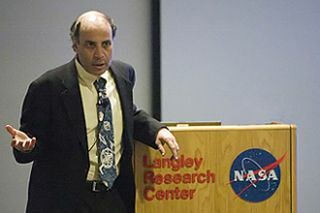 Zubrin is the president of the Mars Society, a group based in Lakewood, Colo., that advocates for manned and robotic missions to Mars. NASA’s Planetary Science division does indeed face a shrinking budget. U.S. President Barack Obama, in his 2012 NASA budget request, asked for $1.54 billion for planetary science, but funding for that account is projected to decline steadily in subsequent years, to about $1.27 billion by 2016. In their 2012 spending bills for NASA, the House and Senate Appropriations committees allocated $1.5 billion to planetary science. To date, neither chamber has brought a bill that includes NASA’s budget up for a floor vote. The U.S. government is currently funded by a temporary spending measure that preserves 2011 funding until Nov. 18. The federal government’s fiscal calendar turns over Sept. 30.